Are you someone who notoriously leans to the person next to you in the theater to whisper your predictions? The gritty, action thriller “Safe House,” Swedish director Daniel Espinosa’s first English language debut, is bound to outsmart you. This impressive film is an absolute adrenaline pumper with it’s abundant shootouts, cringing violence, explosions, snipes, beat downs and car chases. In the few non-action scenes you are either looking at the magnificent South African desert scenery, Ryan Reynolds or Denzel Washington. Not bad. Needless to say, you will not be worrying about the almost inedible fragments of popcorn that just trailed down the front of your shirt during this film. I still feel the adrenaline as I write this review. 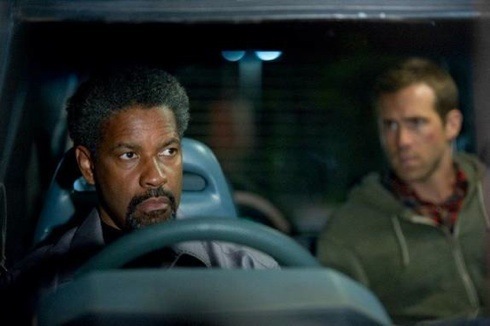 Academy Award winner Denzel Washington is Tobin Frost, the CIA’s largest threat. He is the agency’s recipe for disaster – intelligent and dangerous, especially after he turned his back on them years ago and fell off the map. All hell breaks loose when the intelligence community is notified of his surfacing in South Africa. Frost is transported to a Cape Town safe house where rookie “housekeeper” Matt Weston (Reynolds) is posted and ready to prove himself in handling his first occupant. Unfortunately, things don’t go as smoothly as planned. After the team who brought Frost in tortures him a bit, sirens trigger. The safe house is breached and attacked by a large group of bad guys who want Frost (and everyone in his path) dead. All odds are now against Weston. His integrity is tested, as he now must protect one of the most dangerous men in the world to ensure he stays alive. Frost, one of the best CIA trained ops men, is wanted for espionage on 4 continents. He sells U.S. military codes to the enemy and trades insider information for big bucks. The amount of damage he is capable of is insurmountable…and he’s just getting started. Now he must keep his most important-ever intel close at his side, so close that he actually injects it into his side. While the hostile group of greasy, foreigners raids the premises, Frost torments Weston. “This ain’t a test. This is the real thing,” he says calmly without flinching, cuffed to a metal chair while rounds of gunshots and screaming overtake the background. Frost’s character is filled with wisdom and wit, attributes generally reserved for the “good guy” in such films. The calmness about him makes his character even more threatening. Weston wants a promotion and will do anything to prove himself, but is obviously scared in his innocence. He questions torture tactics, asking other agents, “Is this legal?” Frost takes full advantage of Weston’s naivety, challenging him with questions that resonate. “I’m not your only enemy tonight,” Frost asserts. Audiences feel loyalty to both actors, each incredible in their roles. Washington is so good he makes it look easy. His performance is reason enough to see this film. Reynolds wouldn’t have been my first thought when casting as he’s typically cast in less serious roles like the goofy friend or the ladies man, but he proves himself in “Safe House.” He even speaks different languages. Who knew? If he’s trying to broaden his genre beyond rom-coms and comedies, he’s off to a good start. Espinosa uses shaky camera tricks and quick edits to fit the vibe of this film. At times, the shots almost resemble a security camera as we covertly eavesdrop on secret moments. There is a small dose of romance… no… maybe more like a pinch. This aspect of the film never progresses but Weston’s French girlfriend was probably thrown in to enhance his character development. Do not be mistaken – this is an action-thriller down to the core. In fact, it is very comparable to the “Bourne” series. Bottom Line: If you enjoy action-thrillers you will not leave disappointed. Just when you think you know…you don’t. You’re certainly in store for some surprises.